Health coverage sold on Obamacare’s health insurance exchange in Maryland will be among the cheapest in the country, state officials said Friday. A 21-year-old nonsmoker will be able to buy health insurance that costs as little as $93 a month on the Maryland Health Connection, the state’s health insurance exchange, starting Oct. 1 for coverage that takes effect Jan 1, the Maryland Insurance Division revealed in a press release. Rates for insurance with richer benefits and lower deductibles will be higher and premiums will vary by age, residence location, tobacco use and whether family members enroll. Maryland is the latest state to disclose how much health insurance actually will cost under President Barack Obama’s health care reform law. The state joins California,New York and elsewhere in achieving monthly premiums below estimates by the Congressional Budget Office and others. Officials in states including Indiana have released preliminary findings suggesting health insurance costs will skyrocket as a result of the law. Younger, healthier people who buy inexpensive, bare-bones insurance on today’s market may see higher prices for more comprehensive coverage on the exchanges, while older people are expected to see lower rates. People with pre-existing conditions can’t be turned down or be charged higher premiums because of their medical histories. The law also prohibits women being charged more than men. Maryland Gov. Martin O’Malley (D) and his administration have wholeheartedly embraced Obamacare implementation, in stark contrast to the the 34 states, mostly with Republican governors, that left the federal government to erect the health insurance exchanges that will be used by residents who don’t get health benefits at work or are employed by small businesses. Maryland also exercised its regulatory authority to force health plans to curb rate increases for next year, such as the 25 percent hike initially requested by CareFirst BlueCross BlueShield in April. 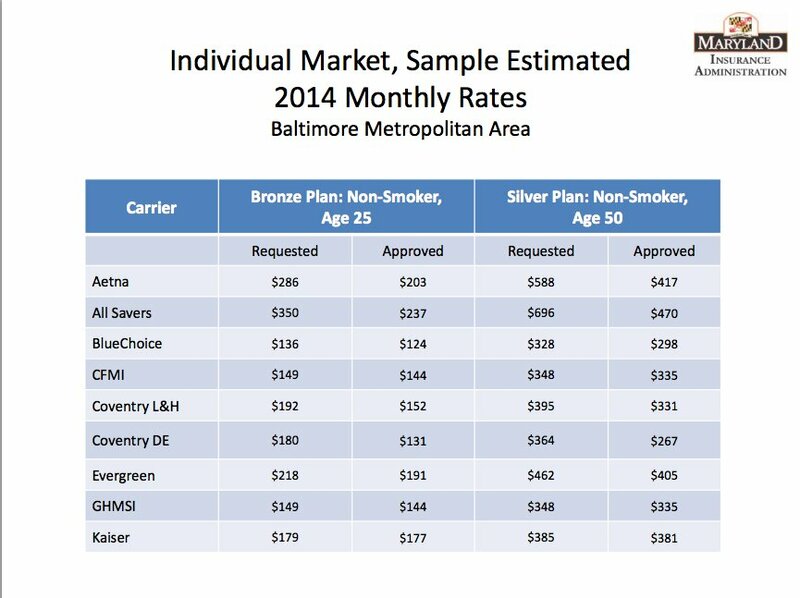 In the Baltimore metropolitan area, a 25-year-old nonsmoker will have access to “bronze” level coverage — the second-least generous of four tiers of benefits — for$124 to $237 a month. A 50-year-old nonsmoker will see monthly prices for a “silver” plan ranging from $267 to $470, according to a Maryland Insurance Administration analysis. By contrast, the median cost of an individual health insurance plan for a 30-year-old, nonsmoking man in Maryland this year is $190 a a month and the cheapest is $62, according to a report issued by the Government Accountability Office this week. An exact comparison can’t be made because current plans aren’t subject to Obamacare’s minimum benefit standards and the least expensive policy has a $10,000 deductible — far higher than will be allowed on the health insurance exchanges. The new exchange prices don’t account for tax credits available on a sliding scale to people who earn from the federal poverty level — $11,490 for a single person this year — and four times that amount. The Maryland Insurance Administration estimates that three-quarters of the people who will use the health insurance exchange will qualify for tax credits that will cut the cost of their coverage. Maryland also is expanding Medicaid to anyone earning up to 133 percent of poverty under Obamacare next year, joining 22 states and the District of Columbia in doing so. The Maryland Insurance Administration said the state’s health insurance premiums are among the lowest available in 12 states that have released pricing information to date. “Among Bronze plans compared for young adults, Maryland rates were lower than those proposed or approved in all other eight states for which a comparison was possible. For example, the lowest price for a Bronze plan for a 25-year-old in Maryland was $114, compared to $134 in Virginia, $146 in Colorado, $163 in Ohio, $167 in Washington State, and $174 in California,” a report by the Maryland Health Connection concludes. The U.S. Department of Health and Human Services announced last week thatpremiums in 10 states and the District of Columbia will be lower than Congressional Budget Office projections. The federal government won’t issue information about the rates on federally run exchanges until nearer to the beginning of the six-month Obamacare enrollment period that begins in October.